1. Click here and sign up on the right of the page. Once you have created an account you’ll be redirected to the offer page. 2. On the offer page you will detailed information on this offer. Hit the “Get Cashback Now” button, you’ll then be redirected to Walmart.com. 3. Once on the retailer website make your purchase as normal. Make sure to choose in-store pickup to avoid a shipping charge. 4. After you’ve made your purchase, you should see your cashback pending in your account within 1 week. When you cashback goes from pending to payable, you can withdraw the cashback to your bank or PayPal account. 1. Click here and create an account on the right of the page. 2. Click here and sign into your account and then click “get cashback now” button. 3. At ToysRUs.com, add The Lorax DVD for $4.99 to your cart and checkout. Choose in-store pickup to avoid a shipping charge. 4. Shortly after you’ve made your transaction, you will see it post in your TopCashback account. 5. Once confirmed, your transaction will become payable within 14 days. 6. Transfer the money to your Paypal account or request a gift card. This offer is available to new TopCashback members only. However, as TopCashback doesn’t limit accounts to one per household, if you’re an existing member now’s the perfect time to tell your husband or wife about TopCashBack. Get any Clearasil acne treatment product for FREE (up to $9.99) after this mail-in rebate here. Product must be purchased by 1/31/17 and rebate must be postmarked by 2/15/17. Save even more when you print coupons for $0.50 off Clearasil Daily Clear and $1 off Clearasil Ultra products. Click here and create an account on the right of the page. Click here and sign into your account and then click “get cashback now” button. Click the “Get Cashback” button to go to the Walmart website. Add Lysol Dual Action Disinfecting Wipes 3-Pack for $5.92 to your cart. Do not add anything else. Checkout and choose in-store pickup to avoid a shipping charge. Shortly after you’ve made your transaction, you will see it in your TopCashback account. You can transfer the money to your Paypal account or request a gift card. This offer is available to new TopCashback members only. However, as TopCashback doesn’t limit accounts to one per household, if you’re an existing member now’s the perfect time to tell your husband or wife about TopCashBack. Purchase Right Guard Xtreme Precision Dry Spray Antiperspirant at CVS or Walgreens and get your purchase price back (up to $6.99) when you mail in the rebate form here. Product must be purchased by 2/28/17 and rebate must be postmarked by 3/15/17. 2. Click here then click “get cashback now” button to go to the Walmart website. 3. Purchase a 138 fl oz bottle of Tide. 2. Visit Walmart.com (through the TopCashBack link) and search for Finding Dory DVD. 3. Make sure it is priced at $19.96 and add to your cart. Do not add anything else to your cart. 5. Within 7 days 21.95 will be credited to your TopCashBack account. This amount will turn payable in 40 days. At that time you can transfer the money to your back account, Paypal account or request an Amazon gift card. Get an 8lb bag of Feline Pine Clumping Liter for FREE (up to $9.99) or a 16 lb bag (up to $16.99) after the mail-in rebates here. Product must be purchased by 10/30/16 and submitted by 11/30/16. Get a FREE individual Mountain House meal pouch for FREE (up to $11) after this mail-in rebate. This product can be found at many outdoor recreation stores or online. Must be purchased by 10/31/16 and postmarked by 11/14/16. Purchase Zantac 24 or 30 ct or Duo Fusion 20 ct between 6/1/16 and 11/30/16 and receive a rebate check by mail of up to $11 on the purchase price (excluding tax) when you mail in the form here. Make this deal a moneymaker when you use this $6 off Duo Fusion printable coupon or this $3 off Zanac printable coupon. Rebate must be postmarked by December 15, 2016. Still available! Get a FREE Zest FruitBoost Shower Gel (up to $2.99) with the MobiSave app. Just text the word Zest to the number 99000 on your cell phone and follow the directions. Offer takes about 10 minutes to show up. To redeem, add the offer to your Mobisave cart. Purchase the product them submit your receipt. Cash back is paid through Paypal and takes about 24 hours after you request payment. Don’t have the app? Get is here for FREE. Have you ever bought something only to have it go on sale the next week? Now there’s a service – Paribus – that automatically gets you a refund on the price difference at 18 different online retailers including Amazon, Macy’s and Target. Want to know the best part? It’s totally free to sign-up. Just connect Paribus with your email account in a few clicks, and shop online as you would normally. Whenever a price drops or you miss a deal, Paribus files a price adjustment, scoops up the difference, and sends it your way (the company takes a 25 percent cut of the refund). 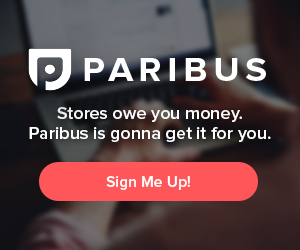 Paribus makes the shopping experience hassle-free by eliminating the need to price compare. They’ve been featured on Good Morning America, ABC World News, CNBC, and Business Insider.